"I would like Europe to have a Triple A social rating, which is as important as having a Triple A economy." Although the wish expressed by Jean-Claude Juncker when he became president of the European Commission in October 2014 has not yet been realized, in recent years there has been a real step forward on social issues. Social welfare was not the priority in the construction of Europe. It was seen more as a biproduct than a core goal. This is evidenced by the provisions in the Treaty of Rome which do not provide for social-welfare measures, but nevertheless raise the issue of improved living conditions for citizens as the expected beneficial outcome of economic development in the region. Social Europe does not have its own founding text, historic turning point or symbols. It is being built gradually, sensitive to the political colours of Europe’s governing bodies. At present, there is no question of member states transferring the regulation of labor relations and social standards to the European Union. Reluctance is still strong, and everyone has their own reasons. "The Nordic countries want to keep their particular social model, the Eastern European countries fear obstacles to their economic development... and France has an unfortunate tendency to want to apply its own system to everyone else," says Sofia Fernandes, senior researcher at the Jacques Delors Institute. Faced with these constraints and tensions, the compromise is often that of the lowest common denominator. This is particularly the case in relation to a recent topic that will become even more important over the next few years: access to social security for self-employed workers. "A directive has been mentioned... but the process resulted in a non-binding recommendation," says the researcher. To break the deadlock, "we need to go further with a group of member states driving it," said Sofia Fernandes, “by moving towards differentiated integration, as we did for the euro and for Schengen.” This suggestion has triggered a lively debate. A Commission determined to make social issues a high priority is a decisive condition for its success. "The Commission undoubtedly has a driving role," says the researcher. "The Barroso Commission tended to put social issues to one side. The Juncker era, on the other hand, has taken a different approach. At the top of the list of the Juncker presidency’s achievements is the adoption of the European Pillar of Social Rights. After extensive public consultation, twenty rights were set out by the member states under three main headings: equal opportunities and access to the labor market, fair working conditions and social protection. Together they constitute the European Pillar of Social Rights, adopted in Gothenburg in November 2017. However, this is soft law - a set of non-binding principles that then have to be translated into legislative acts. Another concrete achievement is the Posted Workers Directive, which was highly publicized in France. The adoption of this text is a definite success because the issue has been a source of tension. "In France we talk a lot about posted workers because we are a major host country," says Sofia Fernandes. “But the countries sending these workers have their own problems: young people leaving, a brain drain.” The researcher cites both Poland, which is beginning to suffer from a lack of manpower in the construction sector, and Latvia, which has lost 20% of its population since 2000. The movement continues with the adoption of a Directive on work-life balance in November 2018. Its flagship measures include the introduction of at least ten working days paternity leave in all countries, as well as parental leave. The victory has its limits because the final text is quite a long way away from the Commission proposal which provided for four months non-transferable leave for both parents. The aim was to avoid it being systematically taken by the mother. The draft also proposed it being paid at the same level as sick leave in all member states. In France, parental leave payments are almost €396 a month, but the new amount would have been 50% of salary capped at 1.8 times the minimum wage. Some member states, including France, opposed these provisions. In the end, parental leave has been set at a minimum of four months, two of which are non-transferable. It will be paid "at an adequate level." Progress less ambitious than anticipated, but a step forward nevertheless. Whilst the majority of observers welcome the direction taken by Jean-Claude Juncker, they fear that the next Commission will be marked by a degree of passivity. Sofia Fernandes feels that in order not to lose momentum and not overly depend on the make up of the next Commission, the solution lies in "an action plan to formalize the foundations." Greater visibility as well as more control. In the social welfare and employment field, although a number of elements are now included on a “social scorecard” for consideration by the Commission, it is still only at the recommendation stage. As things stand, it is difficult to believe that social criteria could be observed and penalized with the same vigilance and the same impact as budget constraints are. "There can be no question of the threat of sanctions,” admits Sofia Fernandes, “but it requires a system based on financial incentives with the adoption of a budget envelope for countries that are making progress in this area." Incentivize, yes, but control too. 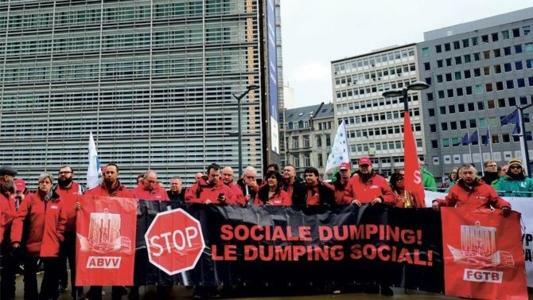 A European labor authority will be created by the end of 2019. The real impact of this new institution is impossible to predict. Its effective authority and the funds allocated to it will be decisive. Communication will also be an essential element. This vital aspect is beginning to be taken into account. With regard to the social rights pillar for example, ambassadors and multipliers have been designated in each country to spread the word. Sofia Fernandes herself is a multiplier and participates in meetings with her counterparts in the different member states. She believes that to make European citizens see social Europe in practice, the only way is by "mobilizing a network or a grassroots support base."